Sad though it may be, most games in our community don't wind up finished for whatever reason. Whether it's the creator's life preventing them from continuing it, or maybe the scope of the project grew too large to finish, or perhaps even that it was just forgotten entirely amongst other things. Whatever the reason, it's always a momentous occasion when one of these games is finished. This quarter's featured project is one such game. Chaos Rising is a rather unique idea. 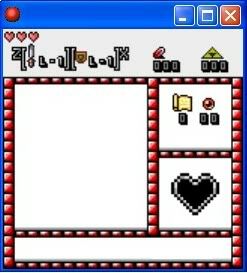 Based upon the style of Game Boy Zelda titles, this entry takes place long after any official Zelda game, telling the story of a weakening Triforce that was last used to separate the world into 5 smaller ones to protect it from an ancient chaos. The seal protecting these new worlds is weakening, and the chaos is threatening to strike again. Project creator Atom has done an amazing job in telling this story, and we sat down with him to ask him a few questions about his story in making the game. 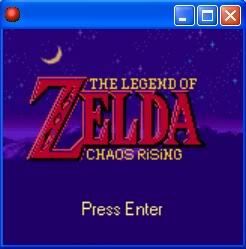 So enjoy our new Featured Project, The Legend of Zelda: Chaos Rising! 1. You are literally the first full fledged Zelda project to be completed in years. What was the design process throughout the project like? Did you design everything out first and then code, or switch between? 2. Due to the availability and simplicity the GB style, did this help to push along the development? Do you think the game would still be in development if it was say, MC styled? I will have to answer those 2 questions in one time as they are connected to how this game was made. 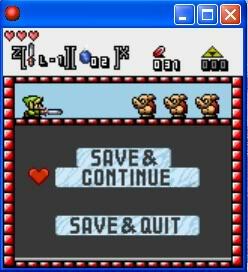 It all started a long time ago, I believe it was near the end of 2003 when I first started working on a Zelda fangame. Well actually I should say the first time I started working on a game. I never took the time to make a more simple game first. My first attempt was also made with Gamemaker but completely with drop and drag functions. 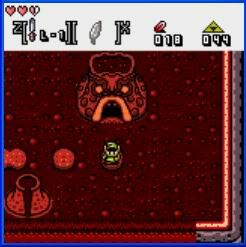 It was named The Legend of Zelda Alternate Evil and I got as far as making the 2nd dungeon for it before I felt forced to abandon it due to the limited options of drop and drag functions. 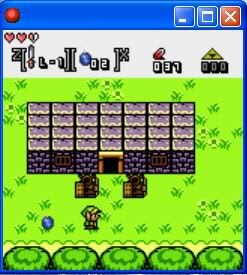 During 2004 I made a full game-engine in alttp style. Which I released on ZFGC during 2005. 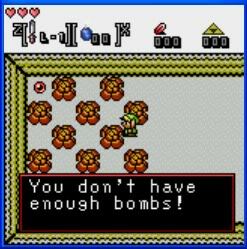 It was early 2005 when I made the first storyline on paper for what you now know as TLOZ Chaos Rising, but still for alttp style, after completing half the backgrounds for the air world I realised that I had made a mistake going with the alttp style. the alttp style has that many details to it that it would take forever to complete it and I did not believe that I would work on it for that long, so no I do not think I would have finished it if I had done it in any other style. I used the rest of 2005 and the first part of 2006 to create a new engine for the game suitable for the gb style. during 2006 I created the overworld maps for all the worlds. March 2006 I finished school and got a job, half 2006 I got my current job. By the end of 2006 I had that much to do that I initially abandoned this project and I did not do any work on it till august 2010 when I felt that I had to finish what I started. I changed part of the storyline and worked out every detail I could think off on paper (I actually have lists of every item type and even a list mentioning ever room and what is inside of them) before working on programming again. starting with creating all of the overworld rooms. The progress of the next 3 years can be found in my project's topic here. I created the enemies, designed and created the caves, housed and dungeon maps first on paper and then the final version in paint. When all the separate parts were done it was only a matter of putting in the storyline to connect everything in the game and place all the objects that I had not yet placed inside the rooms before I could start with testing and fixing lots and lots of bugs. 3. 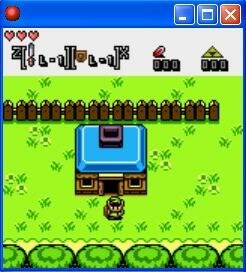 Can we expect to see any throwbacks to previous Game Boy Zelda's? For example, could we run into the Subrosians? 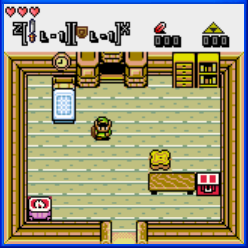 Yes, there are throwbacks to previous game boy Zelda games and even to alttp. You will find a lot of races from the early Zelda games returning to this game. Some things even point back to the original zeldacartoon tv series. 4. The game has been out for a few weeks now. Have you found or gotten any reports on any game-breaking glitches? Well I haven't found any new game-breaking glitches. But I also did not expect to find any more of those. Initial programming was done before the end of November 2013. It has been a lot of time testing and fixing the game after that before releasing it. About other reports, I actually have not received any reports at all, none mentioning bugs but also none about the good parts of the game. I guess there haven't been that many to actually play it yet. 5. What was your biggest hindrance in developing and releasing the project? My biggest hindrance, that would be a lack of time, as it even forced me to quit working on this project for a few years. That I do not have a background in programming also did not help a lot, it sometimes made it very hard to program something having a good idea what the end result had to be, but not knowing how to do it. 6. Finally, how does it feel to have a completed project out in the wild? Well, it feels great to see something that took that long to create actually getting finished. It was a lot of work with sometimes very hard moments, but in the end I enjoyed (almost) every moment of working on it. But it is not only the idea of having a game out there that I created, it is also about setting a goal for oneself and reaching it. 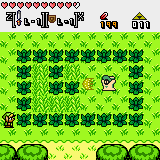 This game does not start where one of the existing games end, it takes place a great time after any known time of Hyrule or any other known continent. Its story is like none before. Its not about who will rule the land, this time its about the survival of everything known to those that live. Ages ago the Triforce weakened from granting all contradictive wishes, a golden world, a dark world, to rule over all, to rule for all. This weakened a function unkown to the Hylians. The Triforce was not only their to grant the wisdom, courage or power of the gods. Its main function was to lock the Chaos away from which the goddesses shaped the world. As seal was no longer as strong as it was meant to be the forces of Chaos started to return to what once was their realm. It twisted the lands and the minds of great man. War came not only to Hyrule but also the the other lands. At the end of this war a hero emerged, but this time he did not fight alone. Together with seven powerful warriors they managed to banish the Chaos Forces back to where they came from. However at great cost. The Triforce of power had weakened the most and fell to the corrupting powers of Chaos. With the imprisoning of Chaos, the Triforce of power has also been lost forever. With their last power, the Triforce of Wisdom and the Triforce of Courage brought together the remaining pure parts of the world which were not affected by Chaos. 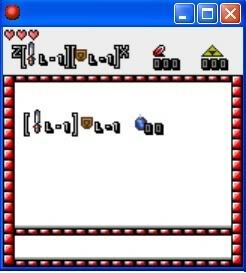 But as there were only 2 parts of the Triforce Remaining and the Chaos sealed but not in an everlasting state, the world was split in several new worlds. After this the Triforce pieces were never seen again. Now a great many ages later the seal that was meant to last till the rise of a new hereo is about to fail. Existing out of some islands floating around the Air World is the home of those of the Hylian race that survived. They founded a nice small village on one of the southeren islands. Though recently some of the islands seem to be affected by a water shortage. Out of the Oceans and a few isles the aquatic world was born. Home to several kinds of creatures, including Zora's and Fairys. In the image of the Sacred Forest a new world was created in its image, home to the animal kingdom. Created from the Temple of Seasons after the seasons were undone by chaos and the reminders of the old Sacred Realm the core of the combined worlds was formed. Allowing Travel to all other worlds a small trading outpost was build. Unfortunately the connection to the other wolds was lost in time. This page was last modified on 1 April 2014, at 22:01. This page has been accessed 9,981 times.